Is UX the New Branding? Something I’ve been thinking about for some time is the relationship between brand and user experience. I’ve come to realise that for me, when it comes to exposure in an online world, there really is little distinction and it’s hard to determine when one process starts and the other ends – or even if there are start or end points… Working as Digital Director for a brand consultancy, more often than I and my team are tasked with making a brand “come alive” or “get their story across” online. For me these client driven terms have some weight and value, but for me the key challenge for our digital team is making their “brand values, promises and customer expectations, clearly and appropriately experienced online“. To help explore this new shift in branding, it’s important to explore the origins of brand. Staring in 2,000 BC there was branding, farmers’ cattle and livestock were branded physically and since then everything has had a “mark” “watermark” or “logo”. Of course since the industrial revolution, we all now understand that branding is not just a logo or graphical representation of a product or service; branding is the communication of features, benefits, lifestyle fit and the emotional connections it sparks with its audiences. The big shift in recent years in branding has come about because of the internet, social media and connected consumers. Branding used to dovetail nicely into advertising and the brands that advertised the most, in the biggest and best way won. No matter how much we connect and have some kind of emotional brand connection with Coca Cola today in an internet ruled world, the hard work to establish a market leading brand was done in the 50’s – 90’s through massive, one way advertising spend. But now the playing field has levelled – advertising can only attract eyeballs – true brand affinity is harder and harder to achieve. That’s where online experience is a massive differentiator. Online experience is where the brand promise can be proven. There is a bit of confusion as to what branding ‘actually’ means in 2014. I mean, the principles and ethos are the same, but it really has had to move with the times and clients demanding branding services must start to realise that their brand is “everything” about them and in a super – connected and socially driven world, it’s also everything about their online presence, behavior and the suitability of their customer online experience. Seth Godin puts it well. Brand is a stand – in, a eupmism, a shortcut for a whole bunch of expectations, worldview connections, experiences and promised that a product or service makes, and these allow us to work our way through a word that has thirty thousand brands that we have to make decisions about every day. The stand out word here for me is “experience” – experience is really the key differentiator online in such a competitive, consumer driven and connected world. Having an experience that matches the brand expectations set by the positioning, promises and expectations already built up by the product, advertising, editorial piece etc, is really what matters in terms of consumers and their brand connection. If you ask many UX professionals, they’ll say that they don’t work in branding, they work in experiences and may use “brand guidelines” supplied by the client or agency in the form of colours, typefaces and style guides. For me UX professionals and in fact anyone involved in providing customer centric digital solutions, need to be branding experts. 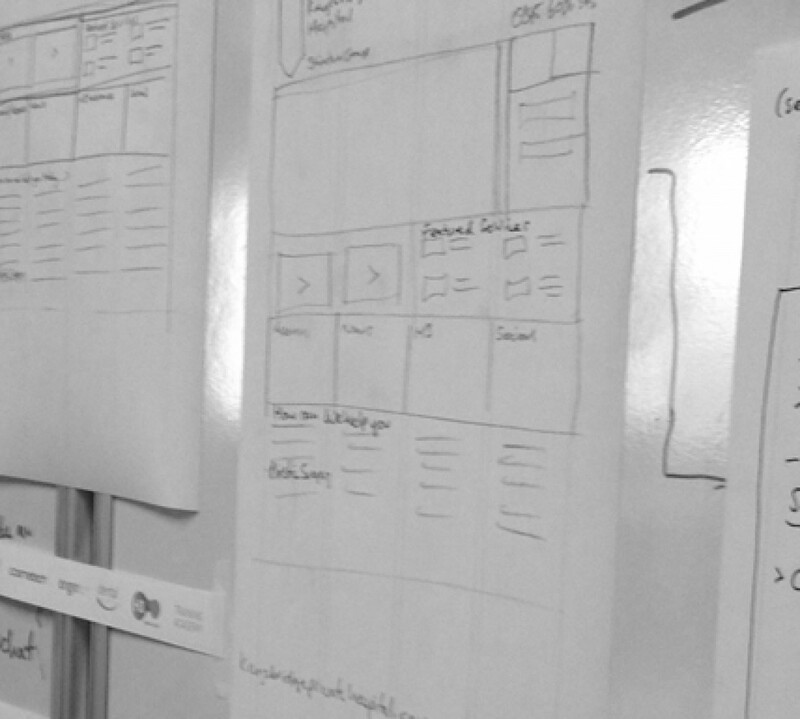 Everyone in the ‘online experience’ team, from the client, through to the web designer, content creators and project managers need to fully understand the brand values, the customers, their expectations and provide a suitable experience to match it. It doesn’t mean that the online experience has to be beautiful, quick, responsive, ultra detailed in content or rich, it simply has to match the brand; whether you are Coca Cola, Rolex or a local coffee shop. Sometimes good UX is ultra simple – 1 page, 1 function and lack of content. Sometimes it’s Amazon and their basic design, yet beautifully tailored, efficient and intuitive web and mobile experience – every scenario is unique. I feel that businesses, when considering branding, should not treat their brand and their web experience and digital footprint as separate when it comes to considering their online representation of services or customer interaction. Quite the opposite needs to happen in my view; all the dots need to be super – connected and they need to realise that the online presence is much, much more than a new logo, new font and nice new branded imagery from an expensive photo shoot. 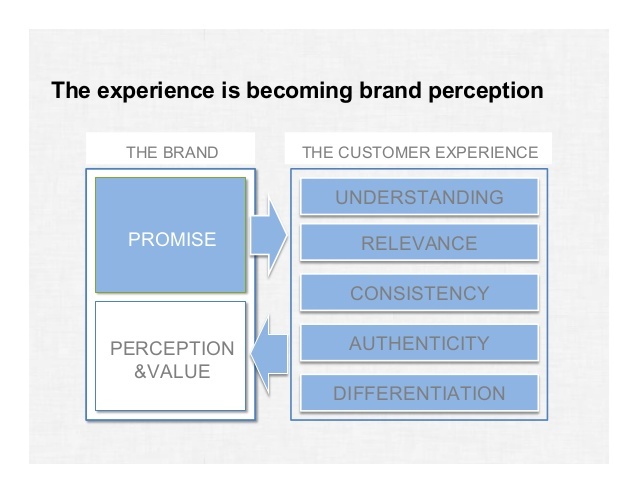 In this example diagram, courtesy of Steven Fisher in his presentation “UX – The New Brand Order.” we can really connect the brand promise, then the experience, which then leads to the real differentiator, which is the perception and value that a brand can bring. So when we consider branding and user experience are they really separate elements? If you’re the consumer of a brand they most definitely are not. Consumers will become aware, consume, get recommendations of and first and foremost experience the sales process of a brand through so many different independent and connected online channels, both passively and actively. Consumers will also build brand affinity and in many ways can shape your brand by their interaction and their sharing behavior – turning what you wanted your brand to be known and valued for to be something else altogether. We all are aware that good UX is not simply applying best practice; it’s researched, considered, tested and refined elements of content, functionality, accessibility, UI design and personalisation all weaving their way together into a suitable experience. Branding, in 2014 is really no different. Whether promoted or experienced online or offline, your brand is only as good as it’s ability to match expectations set by the positioning from the environment you present to customers to, how you talk to them, to how you signpost them in the right direction in an intuitive fashion and by how you service them pre – post and during a sales process. The evolution of branding today is something not driven by a business, but shaped by how the consumer wants or needs your product to work individually for them, is a very real thing. Ultimately it will be this customer behavior, their expectations and the feedback you receive from their experience that will determine how well a brand survives. Unless a brand takes time to listen, act and improve continuously their online user experience, their brand will surely be doomed to failure of not meeting their customers expectations. So to conclude and to re-iterate, for me branding and UX are extremely hard to treat as distinctly independent disciplines and I truly believe that UX could easily be described in many contexts as the “NEW Branding”.